Three of the most common phrases in use today and yet we are, in general overweight, lethargic and suffering from illness more frequently than ever in history. Why? There are a host of reasons why we can become sick. Being involved in a crash or carrying the rare cancer gene could be considered plain ‘bad luck’. However there are hundreds of thousands of people who fall ill because they are not providing their bodies with the basic nutrition required to function as it was intended. Email mike@mikefinding.com for more information or just go to the independent Plant Minerals News website to see more. In light of the recent statistics on the rise in obesity in the Western World, it’s a strange fact to behold, but in this affluent society where we have most things at our fingertips we are suffering from an epidemic of malnutrition. One answer does lie in the soil! There simply aren’t enough minerals left in our degraded and overused farming land to produce food of the standard and quality required for optimum nutrition. Cartoon character “Popeye” would have been appalled. His can of spinach provided him with a good bio available portion of iron but that same spinach now contains so little iron he would have to consume 100 cans of spinach to make up for the deficiency. Unfortunately its not just iron. We have lost up to 75% of our soil minerals in the past 20 years and the problem is getting worse. Governments are aware of this crisis and several reports have been made to both the US Senate and our Parliament. Although we fully advocate the use of organically grown food and a whole food diet, this does not solve the problem, you cannot be completely sure that ‘organic’ means containing all the 70 to 90 elements required for optimum health, – in fact it doesn’t. 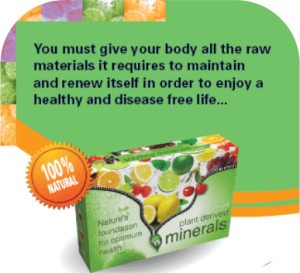 Growing each crop removes over 65 minerals from the soil and we replace 3 with chemicals. A losing battle. Organic means we don’t even replace the three, as we do not use chemicals, so in fact the equation is even worse. Try as we may to find a healthy uniform diet for everyone, experience shows that its about as easy to convert builders and lorry drivers from eating steaks & burgers as it would be to get your cat to eat salad.